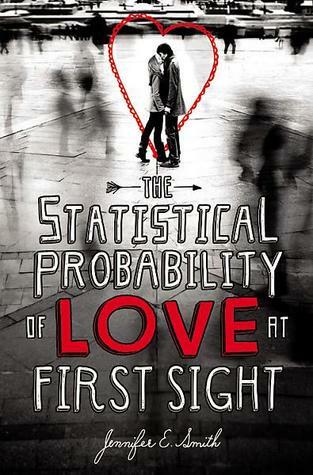 The Statistical Probability of Love at First Sight can be described in one word: Adorable. As I first started reading it, I knew it would be such a fun read. It's a very short book, with a very cute long name. Just the perfect fun read I was looking for. Hadley misses her flight to her Dad's wedding by four minutes, so she books another flight which is due to fly after three hours. That's when she meets Oliver. Now thank God, Oliver is not the "bad boy" type. He's british, and I love the way his characteristics was. He was just smooth, and easy. Hadley and Oliver go in the same flight, and oh guess what, they also have seats that are beside each other. Throughout the 7 hour flight to London, the readers experience the awkwardness and cuteness of the whole situation. They talk throughout the trip, someone sleep's on the other's shoulder, and etc. The part that kind of made this book lose a music note, is how there wasn't much Oliver in the book. After Hadley reaches to London and goes to her father's wedding, it mostly revolves around her family. How Hadley is coping with her dad's marriage, and how she misses her family as a whole. Judging by the cover and all, I just guessed there would be more interaction with Oliver. Overall it was a great book, though I still do wish I could have seen more of Oliver because he's just so irresistible! Even though I expected it to be better, it was still a great contemporary! This book was adorable! I must admit I went into reading it with some expectations. I hoped it would be the next Anna and the french kiss for me. I mean the premise had it all. A 24 hour setting, a girl meeting the perfect british *squeel* guy, named Oliver (how adorable is that name?) at THE AIRPORT (perfect setting or what?). They end up sitting next to each other the whole ride to london (for her father's wedding), which means close proximity. Some people feared that insta-love will make an appearance in this book, but I'm glad to say, it did not. However it wasn't exactly up to my expectations. There was a bit too much drama for a book that was around 200 pages. I felt a high ratio of the book was spent on Hadley's problems with her dad leaving her and her mom, and also marrying another woman two years later. Throughout many parts in the book all I was thinking was "enough with the daddy issues, I want Oliver time!". However I did enjoy the father-daughter dynamic, if only it was cut a few pages short. Jennifer's writing was fun fun!, I especially loved the beginning bit with the "What Ifs..". Overal, The Statistical Probability of Love at First Sight (wanna say that fast out loud?) was a cute, fun, and fast read. I would definitely recommend it to all contemporary lovers! Yes yes yes! Totally agree with both of you on this. I wished there was more Oliver. But the setting and the story was just such a cute read, I don't really care. And I love the father-daughter bonding. Lol. I said the title out loud so fast so many times to my friends while trying to recommend this book and they went "HUH?!?!" Hmm, it appears you both found the book ADORABLE! Excellent reviews that made me want to read the book.